Because of the successor products Prog-Studio 9 and Prog-Express, the only practical usage of Prog-Studio 6 is to control obsolete pre-USB programming devices like the EPROM Programmer 4. For developing microcontroller applications, please take a look at the new Prog-Studio 9 software. For USB programmers, please use the Prog-Express Software (Freeware). Beside basic functions as reading, programming, comparing, copying and erasing chips in the Batronix programming devices,Prog-Studio 6 offers numerous other functions. The Hex/ASCII editor gives you many options for working with the component contents and the MC editor integrates a comprehensive compiler/assembler/debugger for developers of microcontroller applications. Data can be loaded and saved in the binary, Intel-Hex, Motorola-S and other formats. Special features, such as burning from/to a certain memory address (offset) as well as separation into even and odd addresses (splitting odd/even) are supported. Data comparison function (verify) with bit-to-bit comparison. Important information is always at hand with the supplementary "Commands" window. The hexcode, as well as the required bytes and machine cycles, are also shown for each command. Speedy navigation and improved overview with the supplementary "jump marks" window. The selected routine or jump mark is displayed at a click of the mouse. Notes can be stored in the supplementary "Notes" window and are managed separately for each created program. Integrated debugger with single step function and stop points directly in the source code! Display of all registers (SFR) and memory addresses (RAM as well as external RAM). Direct assembly/compilation and burning of data in a Batronix programming device by one mouse-click! Windows 7 and Windows Vista won't be supported! OS: Windows XP, 2000, ME, 98SE Note: Windows 7 and Vista are not supported! There are two handbooks for the Prog-Studio 6 software available. 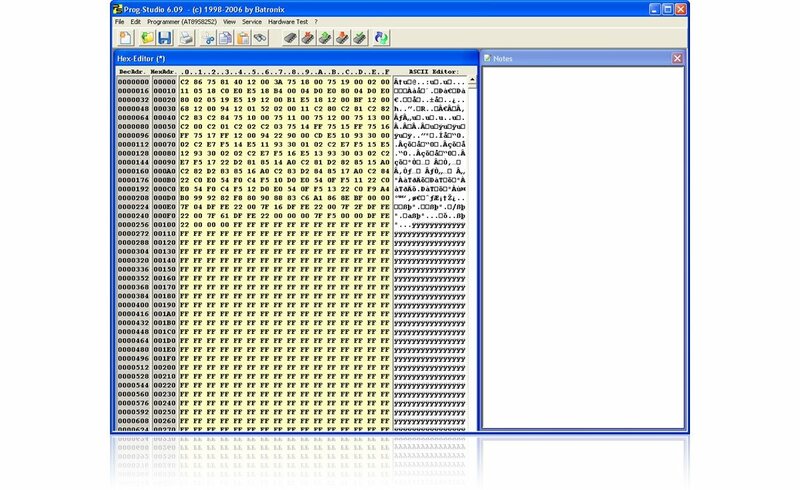 The first part explains the general usage of the software, the hex-editor mode and the programming of chips. The second part explains the assembler/compiler for developing of microcontroller applications. Since the majority of users will only need the first part, we have split the handbook into two parts.